9 DVDs · approx. 17 hrs. COVERS THE MOST RECENT EXAMS! TAKE THE STRESS OUT OF ACT SUCCESS! 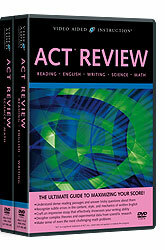 The ACT is a curriculum-based college entrance exam that’s popular throughout the U.S. Similar in function to the SAT – but unique in that it includes a section designed to assess scientific reasoning skills – the ACT is actually preferred by many college admissions offices when they’re deciding whether to reject or accept applicants. In this way, ACT scores can make or break your chances of getting into the college of your dreams. The ACT is truly a daunting exam that requires a brisk pace and a broad range of knowledge: from reading “between the lines” to fixing misplaced modifiers, from evaluating scientific theories to tackling tough geometry problems. And if you elect to complete the optional writing sample, even your ability to craft a timed essay will be put to the test. Now, Video Aided Instruction can give prospective college students an edge! 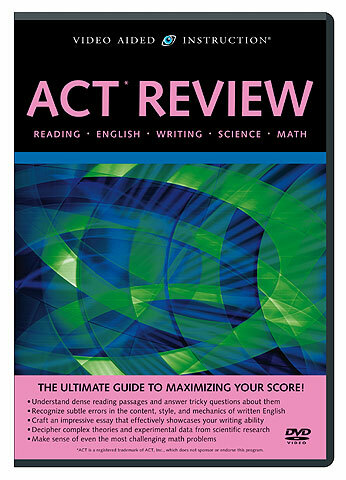 This comprehensive DVD set gives you all the tools and techniques you’ll need to make the most of your study time, improve your test-taking skills, and maximize your ACT scores!